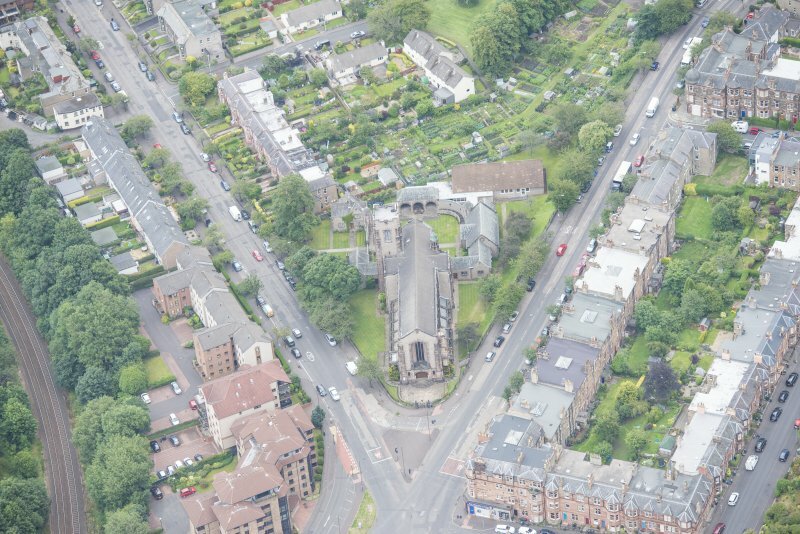 Oblique aerial view of Reid Memorial Church and Church Officer's House, looking NE. West Saville Terrace, Reid Memorial Church, interior. 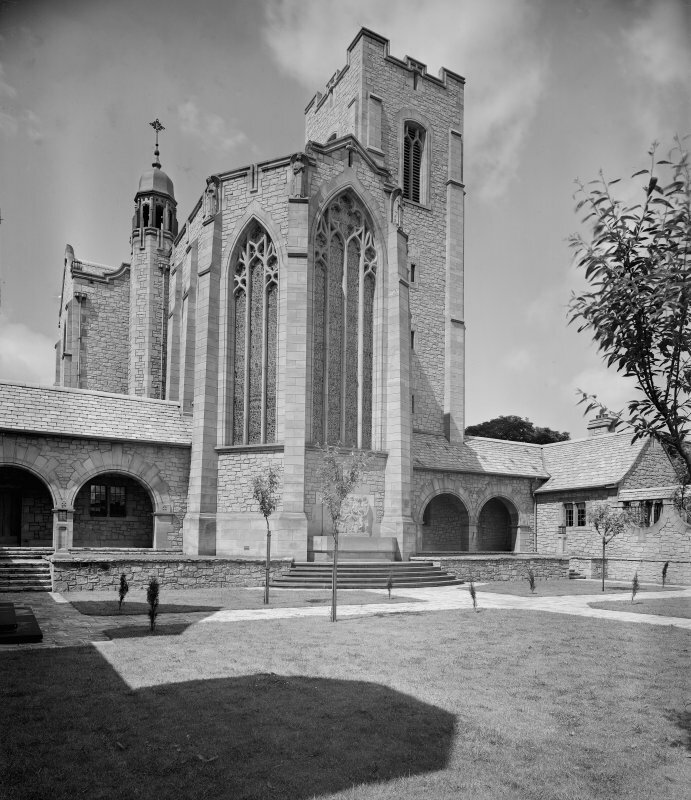 General view of Nave and Chancel from West. 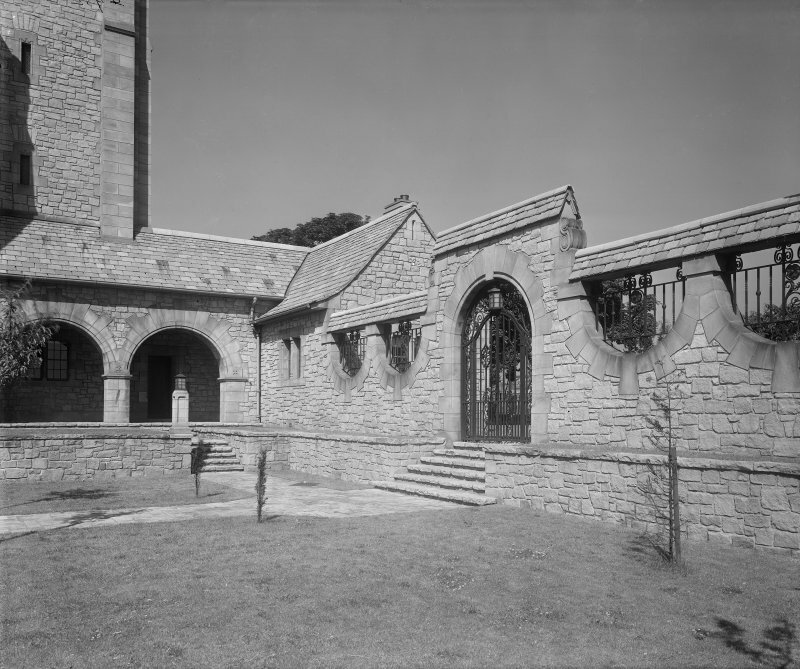 Reid Memorial Church, General view from East side of court. West Saville Terrace, Reid Memorial Church, interior. 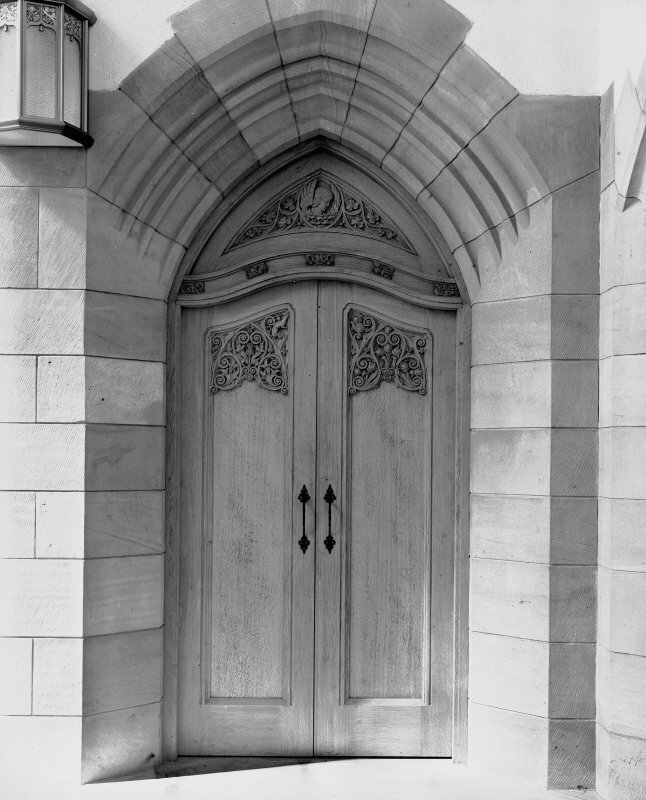 General view of carved-oak door at end of nave from East. 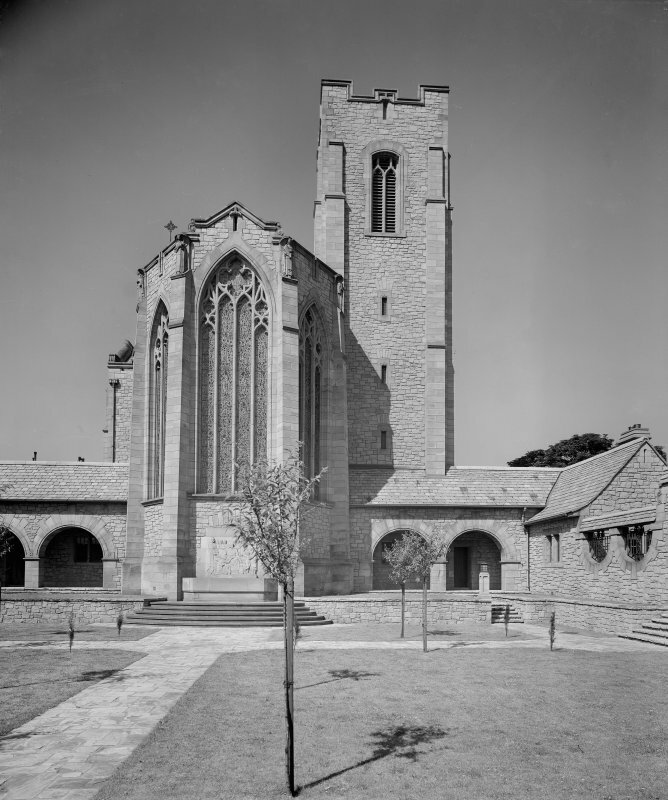 Reid Memorial Church, General view from Court. 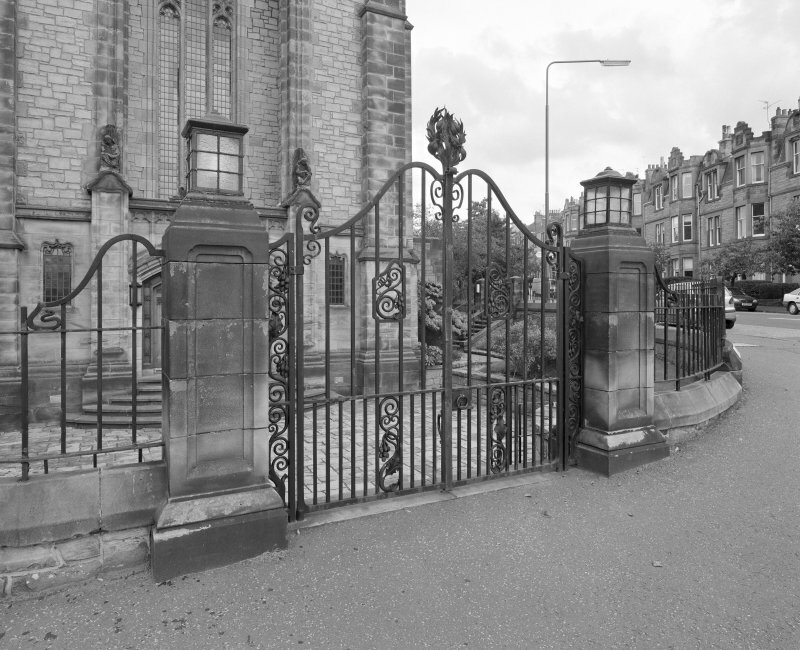 West Saville Terrace, Reid Memorial Church, Edinburgh. 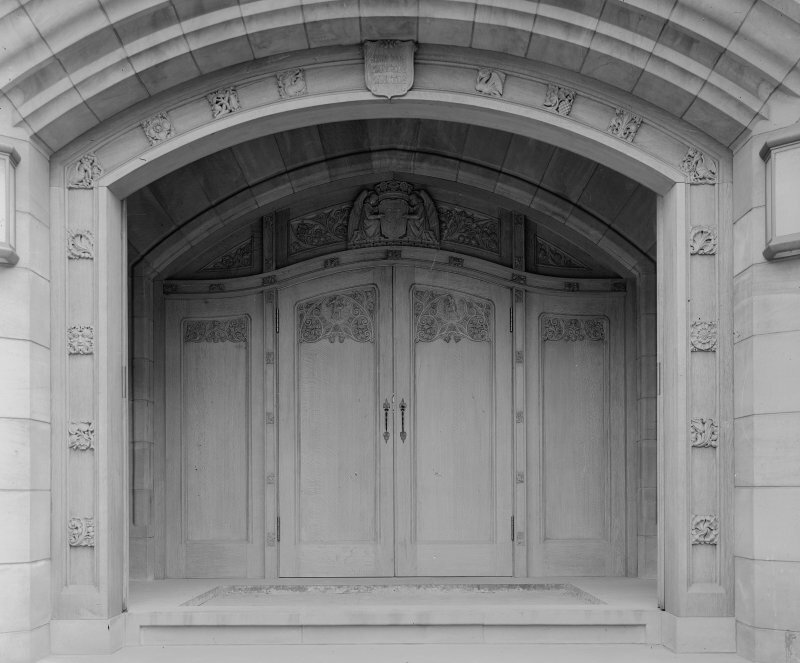 View of Entrance Doorway from West. West Saville Terrace, Reid Memorial Church, interior. 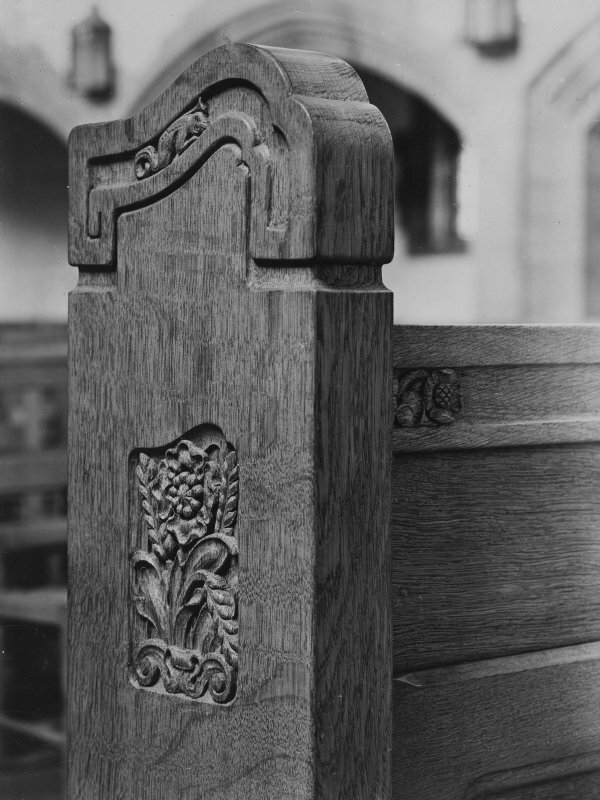 Detail of Choir Stalls. Religious building fixtures. 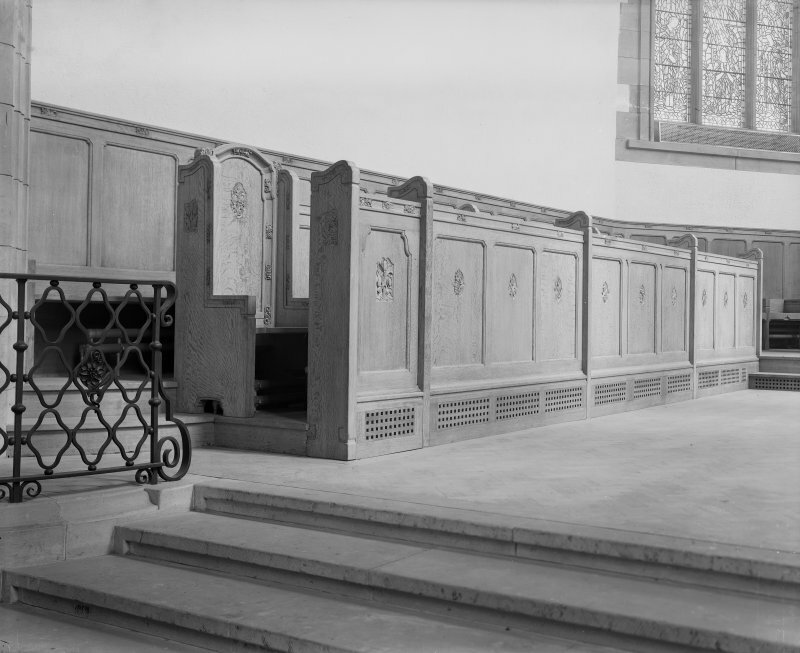 Copy of photograph showing detail of pew. 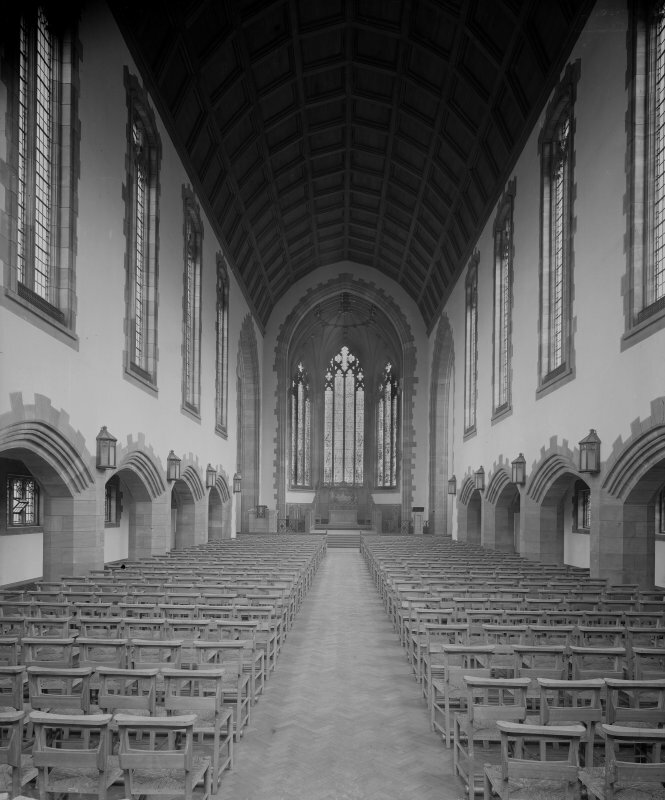 West Saville Terrace, Reid Memorial Church, interior. Genral view towards Chancel from West. 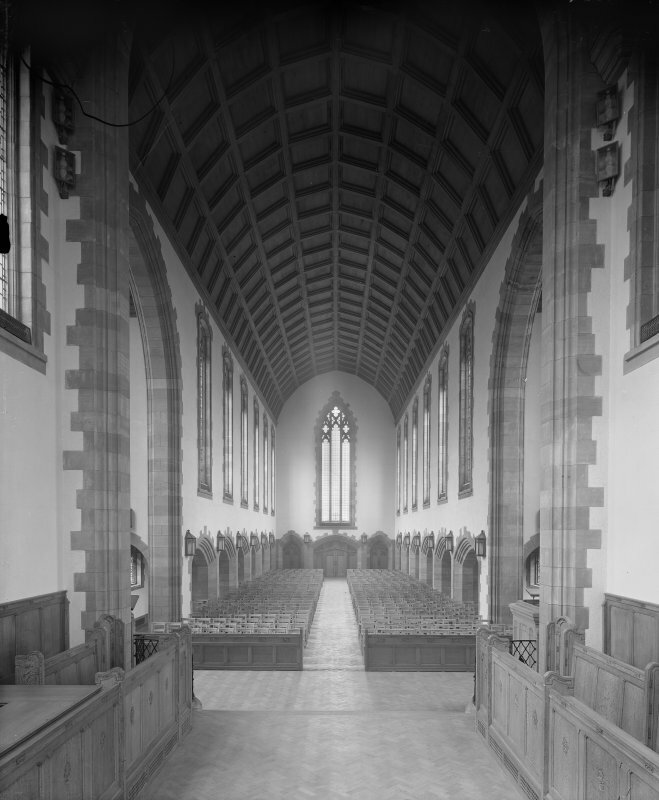 West Saville Terrace, Reid Memorial Church, interior. General view of chancel from West. 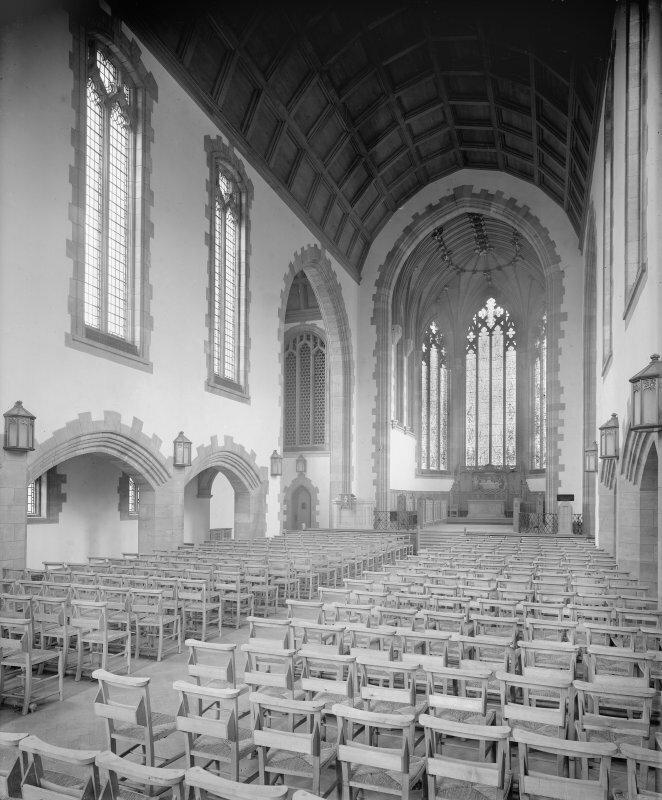 West Saville Terrace, Reid Memorial Church, interior. 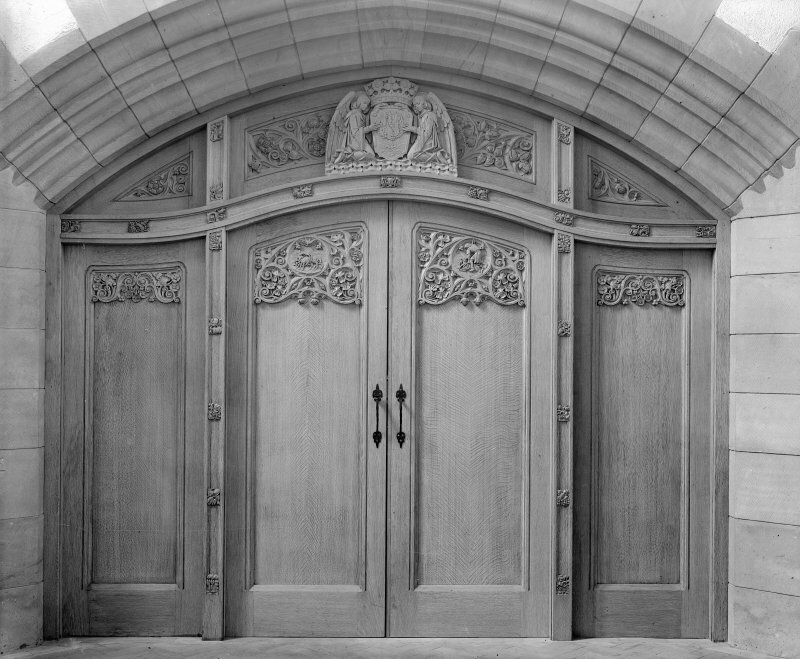 General view of Entrance Doorway from East. 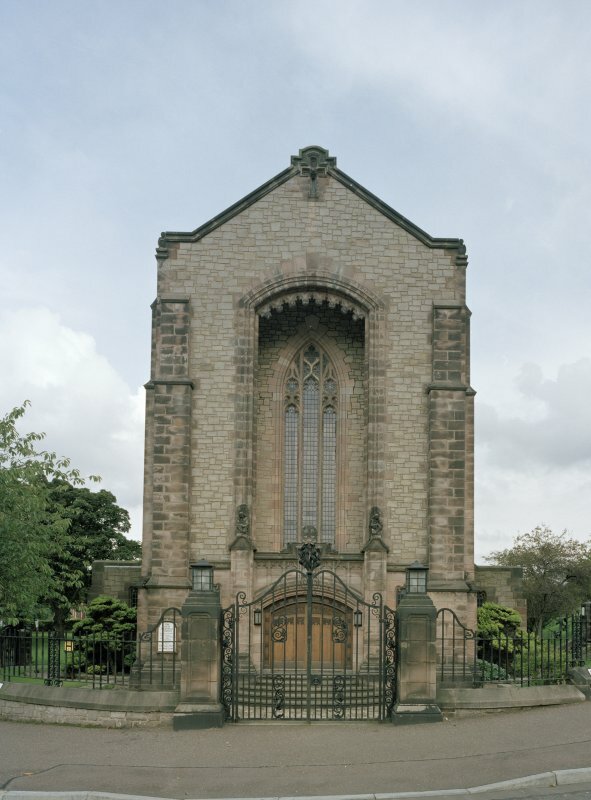 West Saville Terrace, Reid Memorial Church, Edinburgh. General view from West. 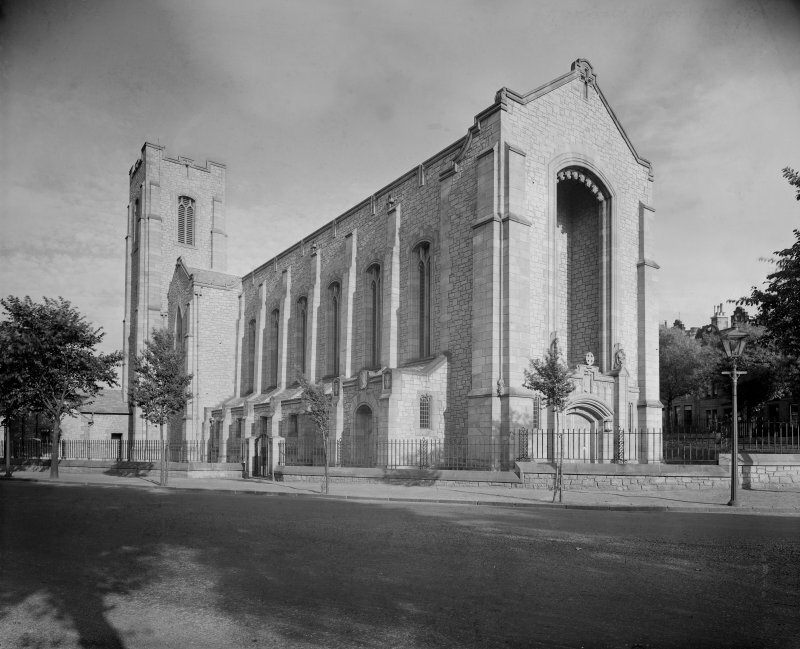 Digital copy of general view from West North West of Reid Memorial Church. 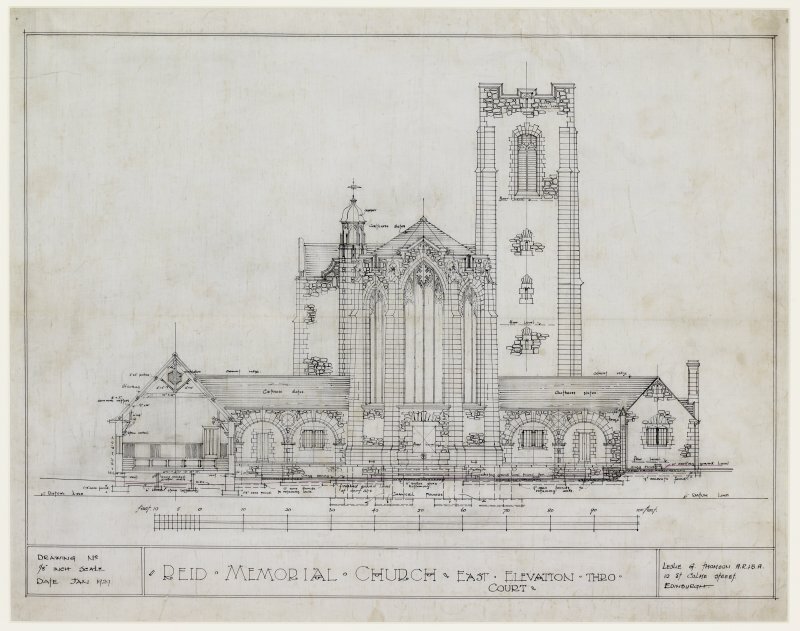 Reid Memorial Church, Photographic copy of design for stained glass window. Signed: 'Leslie G. Thompson' and 'James Ballantyne' and dated: '21.7.30'. Watercolour on board. Scale 1 inch: 1 foot. 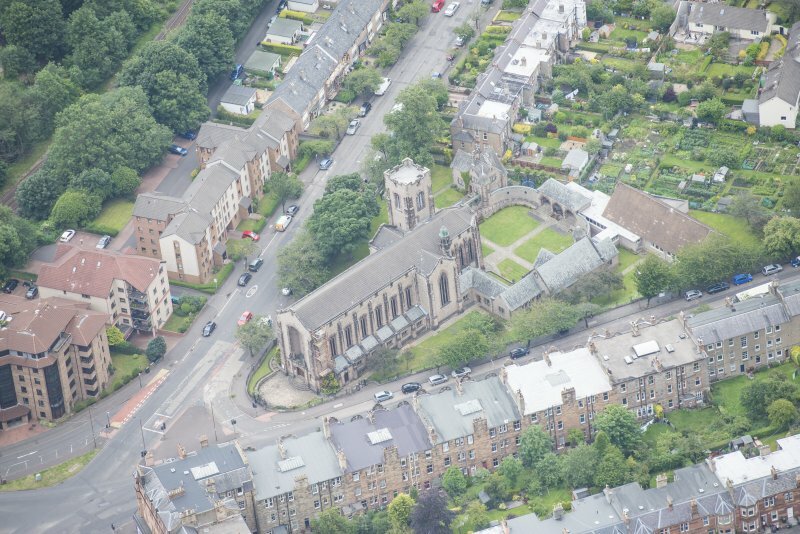 Oblique aerial view of Reid Memorial Church and Church Officer's House, looking ESE. 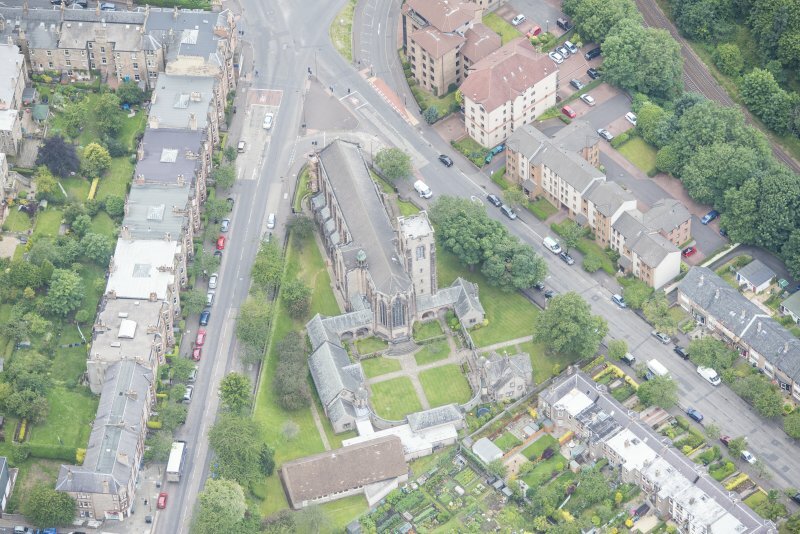 Oblique aerial view of Reid Memorial Church and Church Officer's House, looking SE. 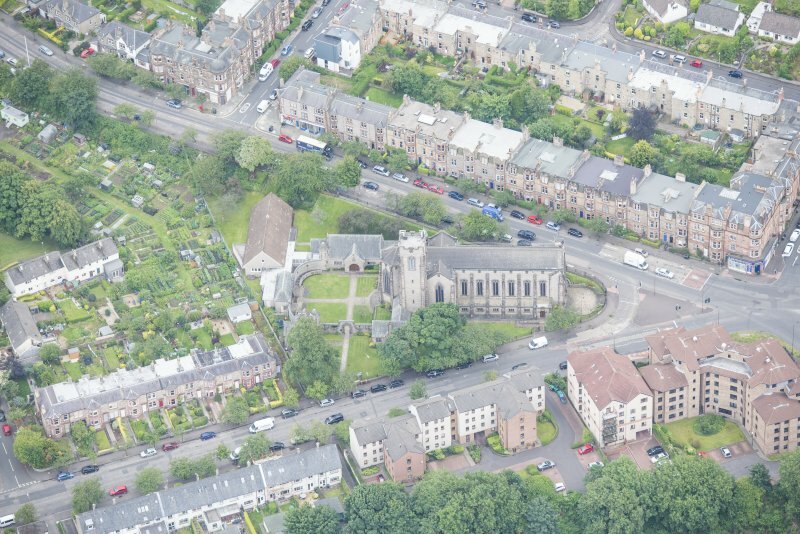 Oblique aerial view of Reid Memorial Church and Church Officer's House, looking W.
West Saville Terrace, Reid Memorial Church, interior. 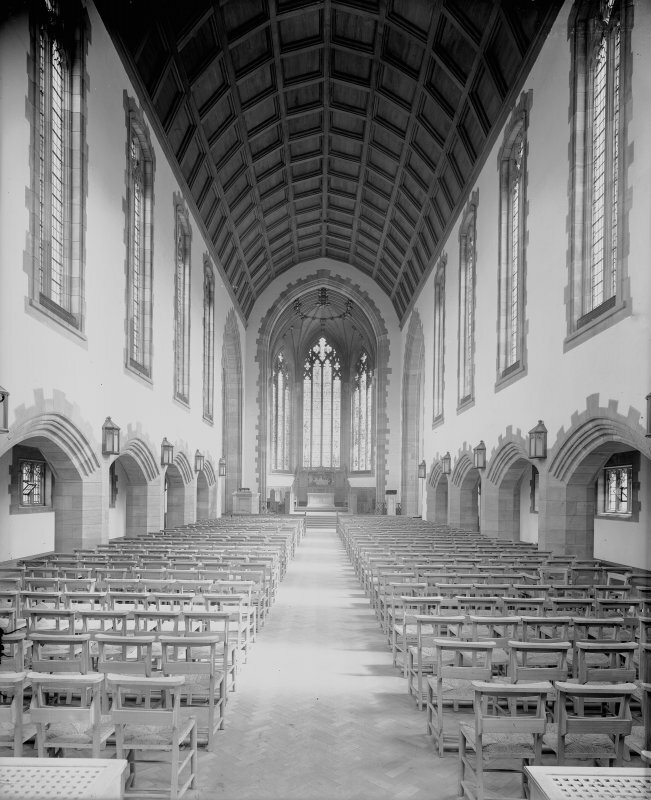 General view of Nave from Chancel. Design for stained glass window - two copies of same design on one plate. 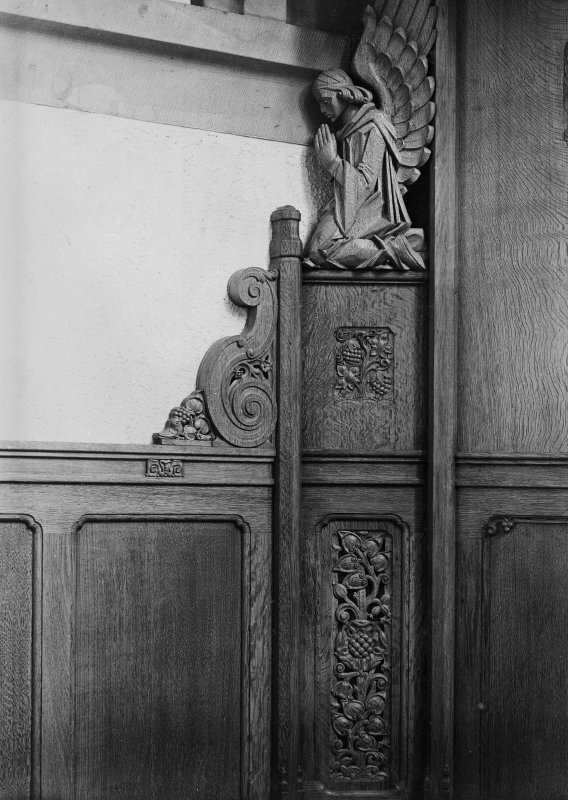 Copy of photograph showing detail of panelling with praying angel motif. 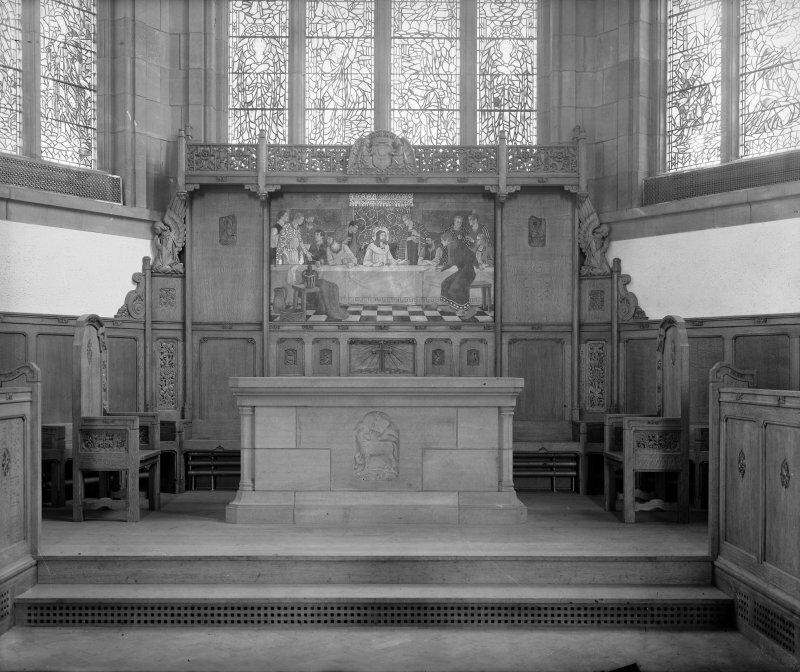 Copy of photograph showing altar and reredos showing Last Supper, Agnus Dei (Lamb of God) and angels supporting shield (coat of arms). 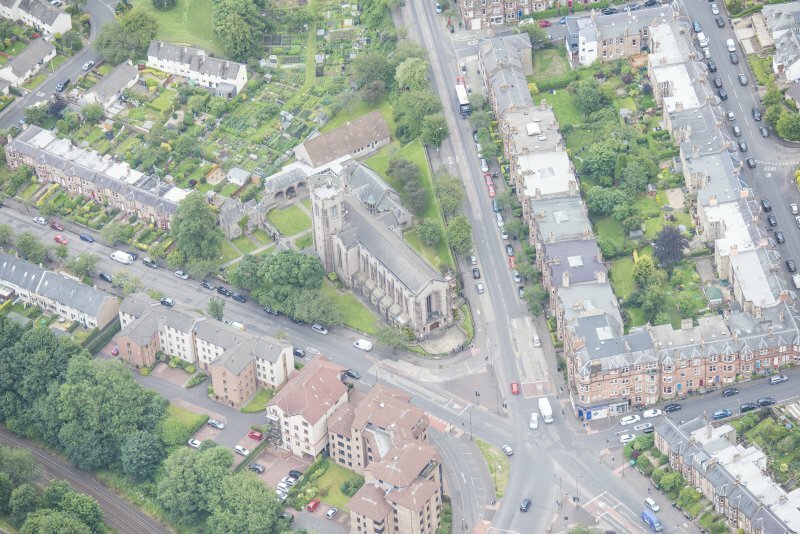 Oblique aerial view of Reid Memorial Church and Church Officer's House, looking WSW. 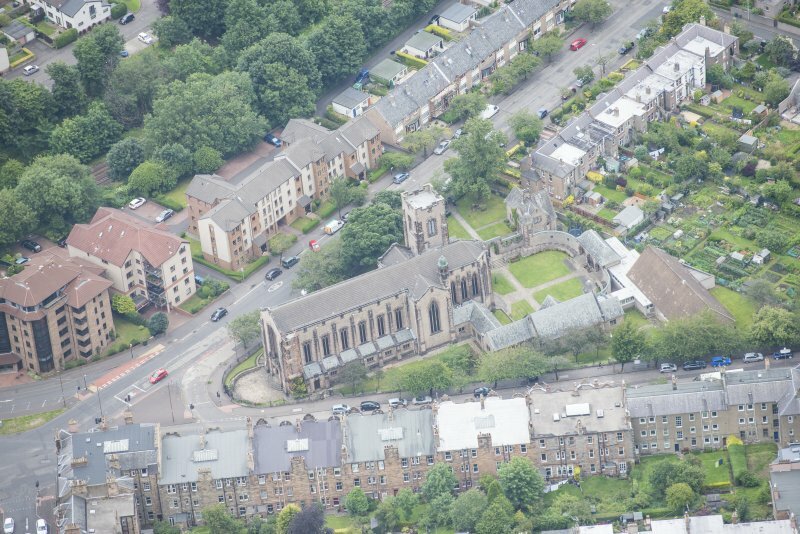 Oblique aerial view of Reid Memorial Church and Church Officer's House, looking WNW. 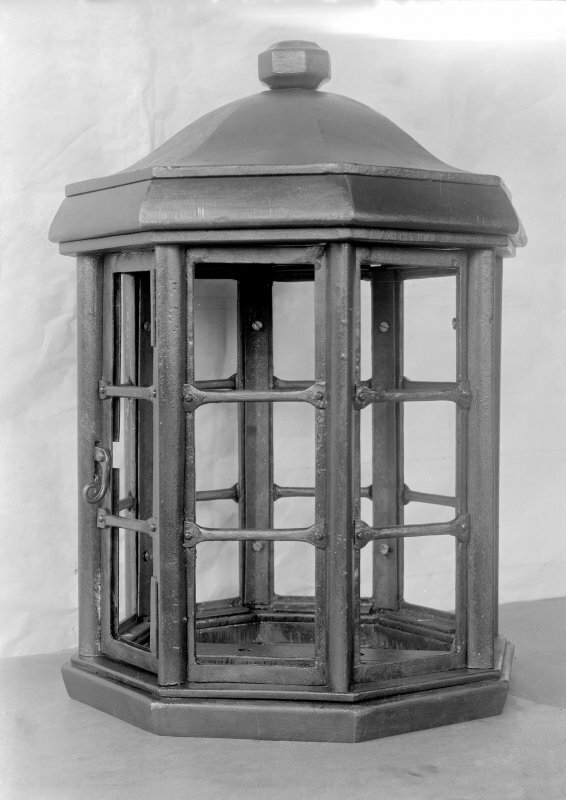 View of Iron Church Lamp with white screen behind, from Reid Memorial Church, Edinburgh. Reid Memorial Church, interior, Detail of ironwork by Hadden in the Chancel. 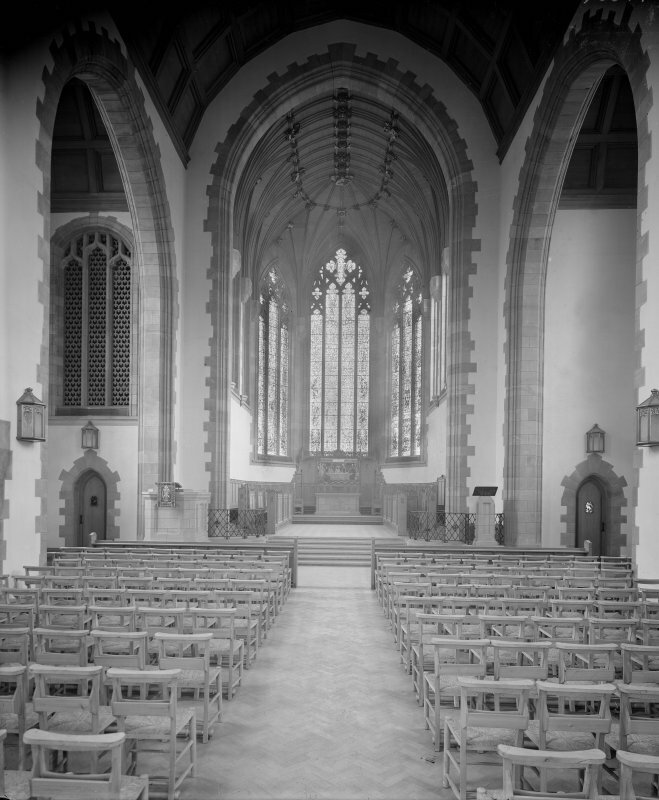 West Saville Terrace, Reid Memorial Church, interior. 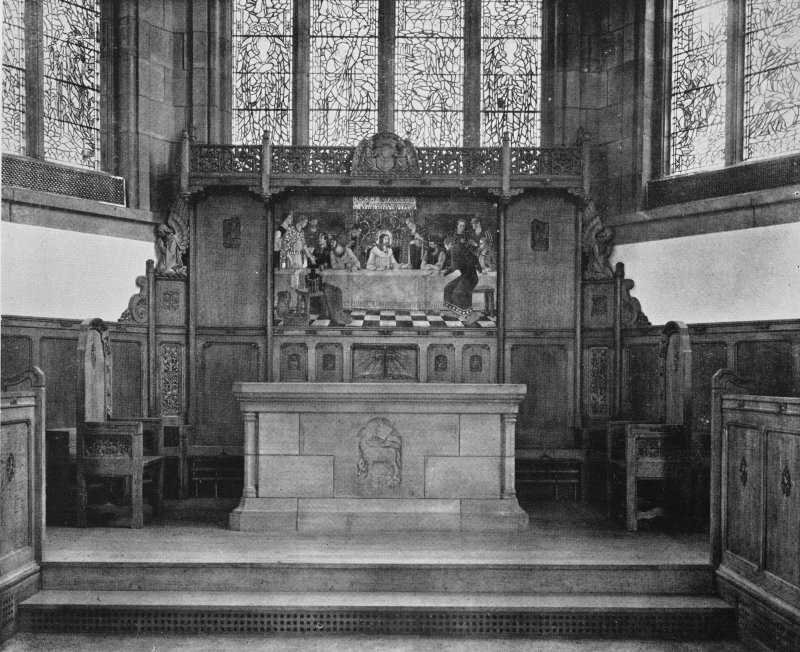 General view of Communion Table, Ministers and Elders Stall and painting of 'The Last Supper'. 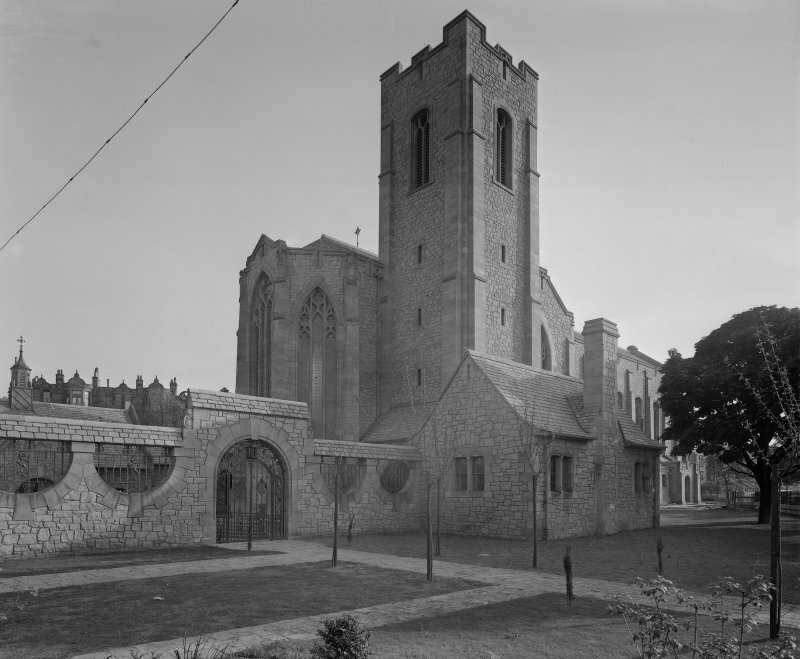 West Saville Terrace, Reid Memorial Church. General view from East side of court. Digital copy of view from NNE. Details of minister's stall and elders' seats. Scanned image of D 73246. 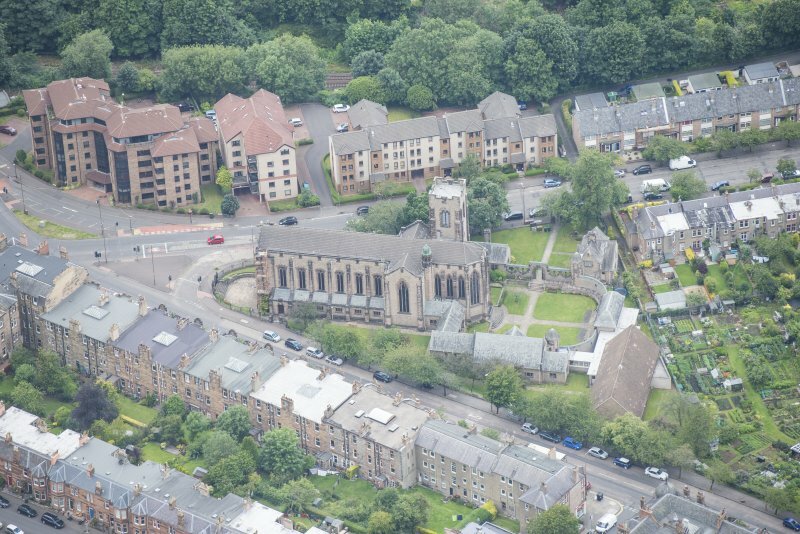 Oblique aerial view of Reid Memorial Church and Church Officer's House, looking SSW. 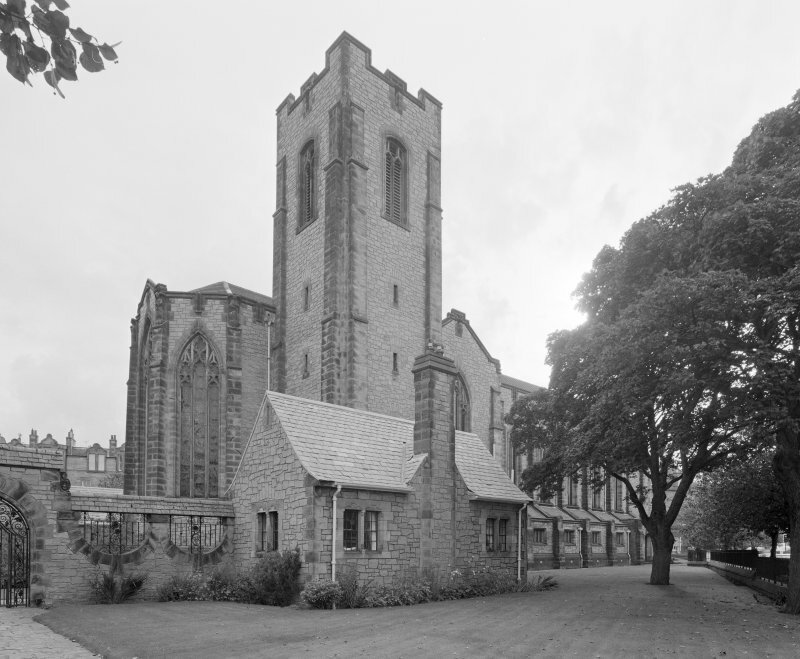 West Saville Terrace, Reid Memorial Church. 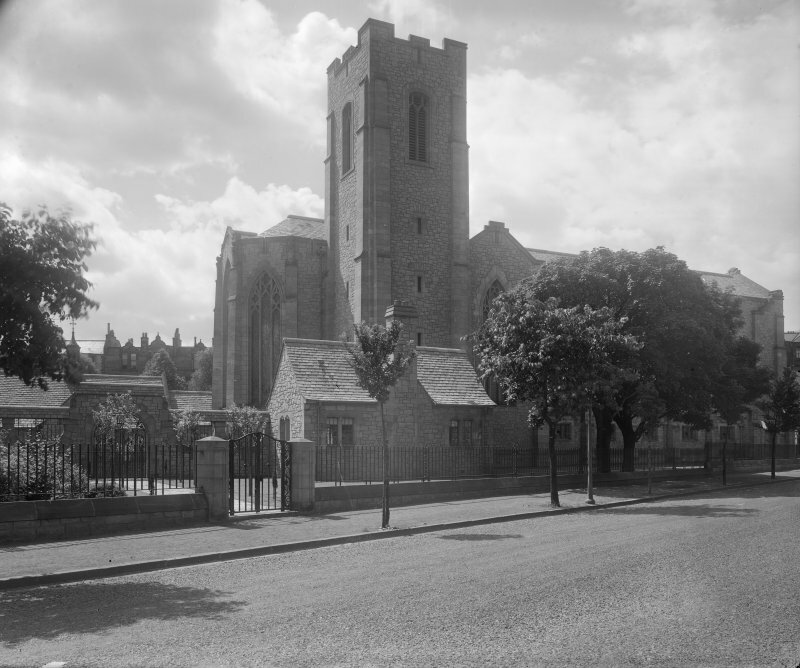 General view from North East. 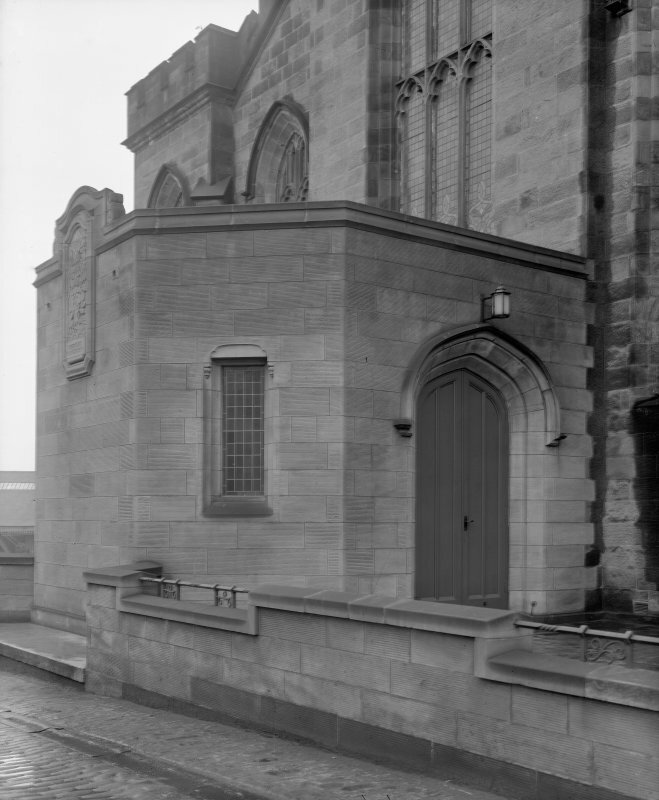 East elevation through court. Scanned image of D 73245. 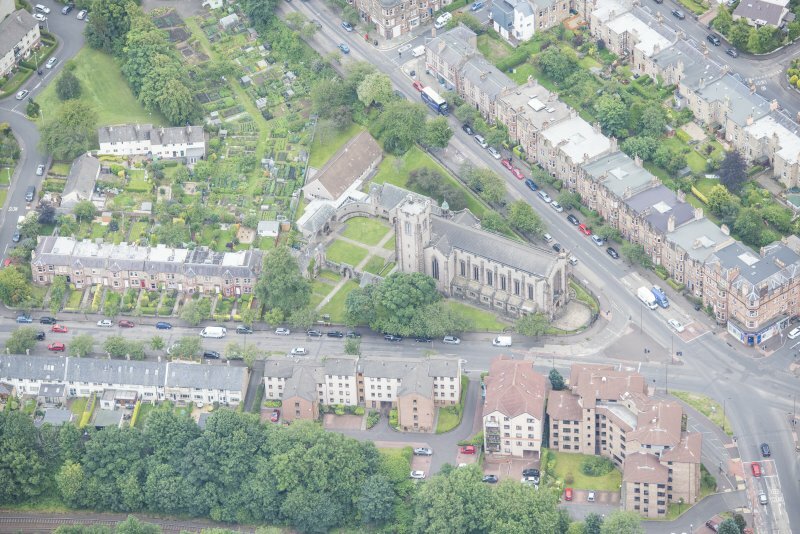 Oblique aerial view of Reid Memorial Church and Church Officer's House, looking N.
Oblique aerial view of Reid Memorial Church and Church Officer's House, looking NNE. 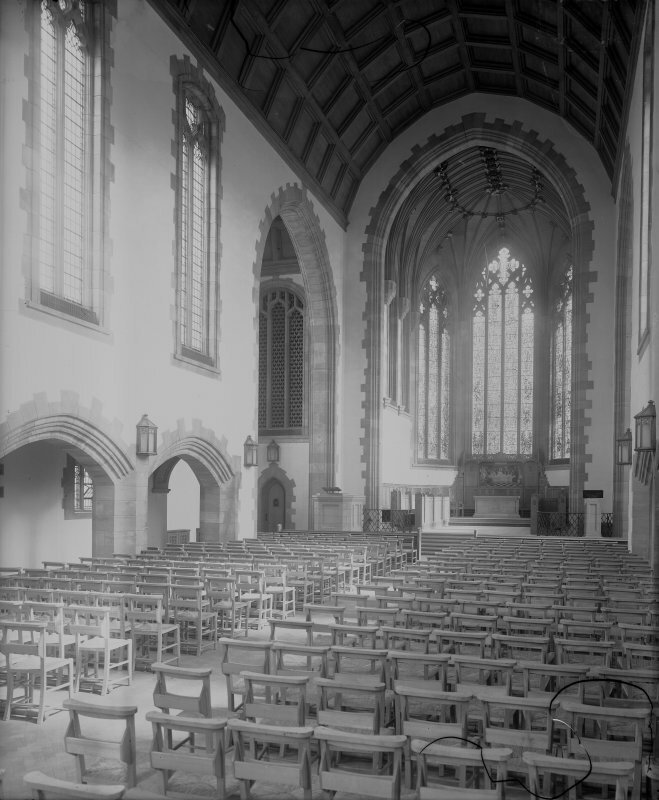 West Saville Terrace, Reid Memorial Church, interior. 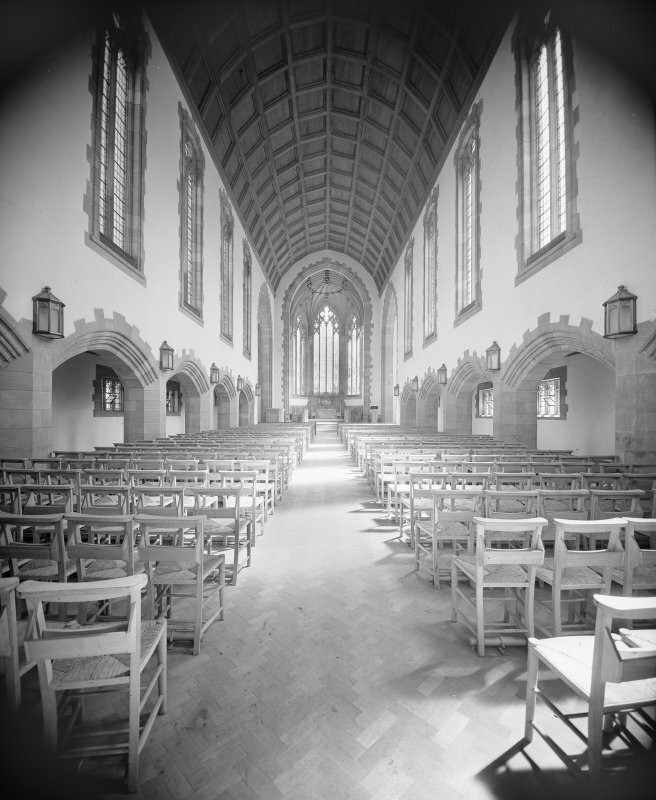 General view of Nave, Chancel and Altar from South West. 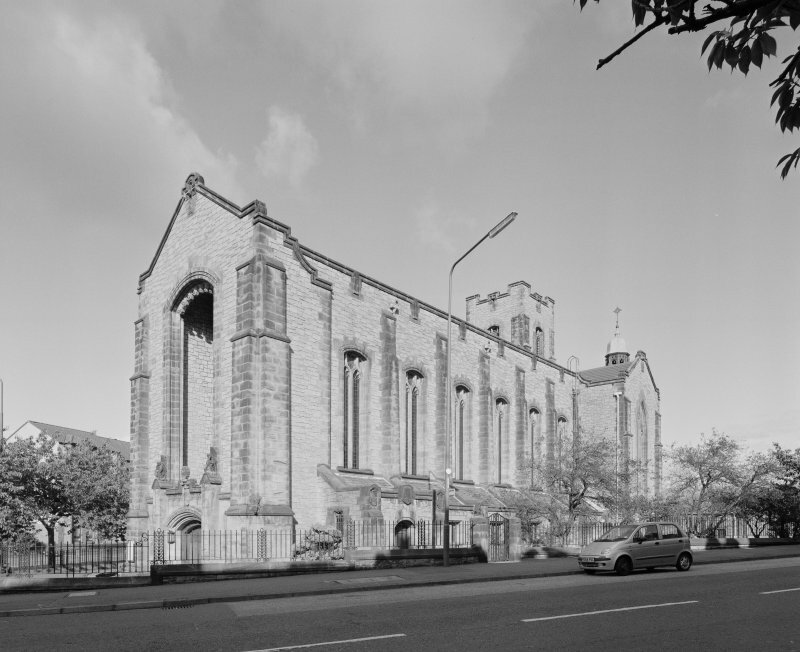 West Saville Terrace, Reid Memorial Church. General view from South East side of court. 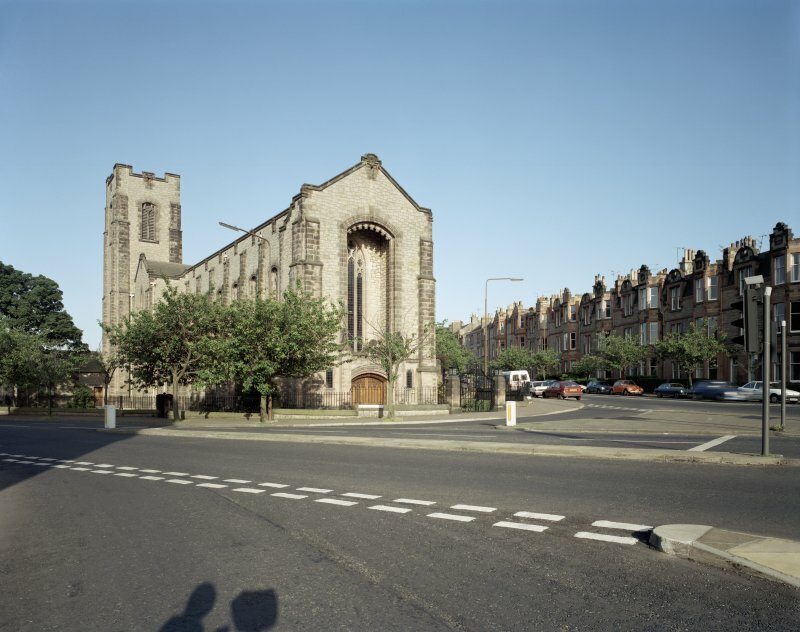 Edinburgh, West Saville Terrace, Reid Memorial Church. 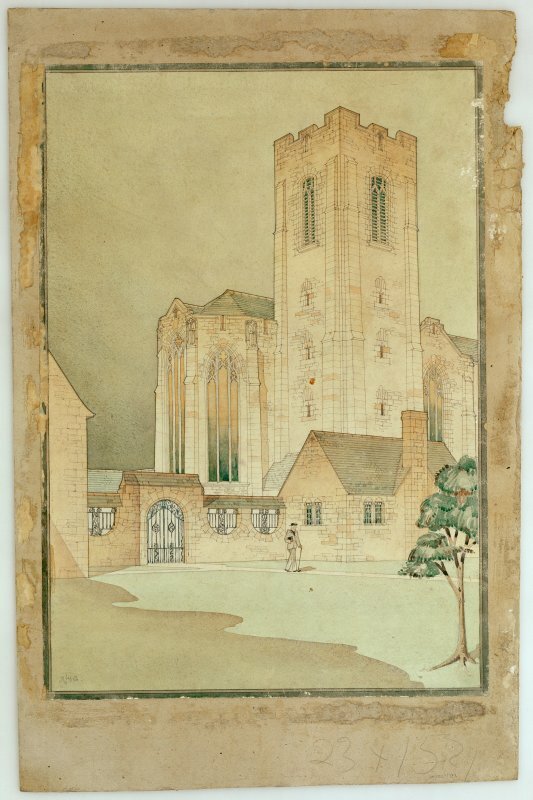 Photographic copy of presentation drawing showing an exterior perspective view by Basil Spence. Image shows item after conservation treatment. 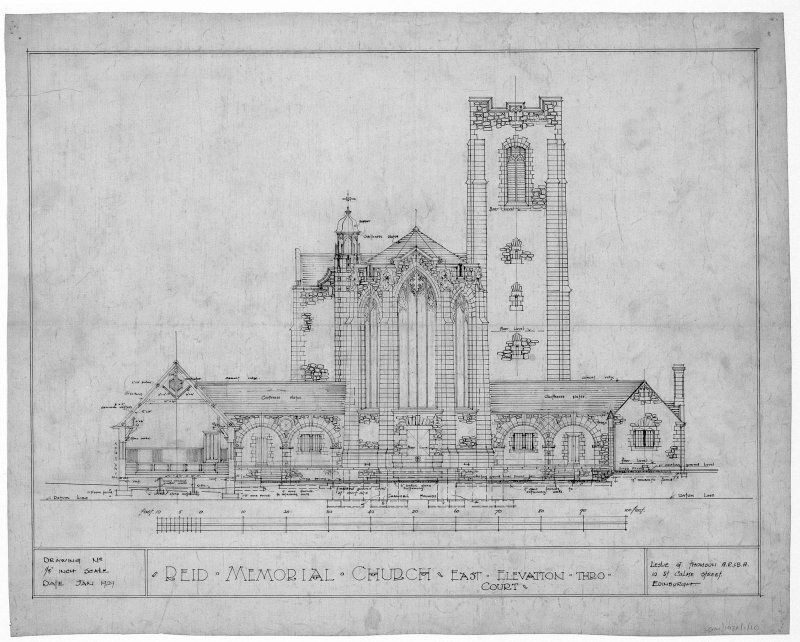 Scanned copy of presentation drawing showing an exterior perspective view. 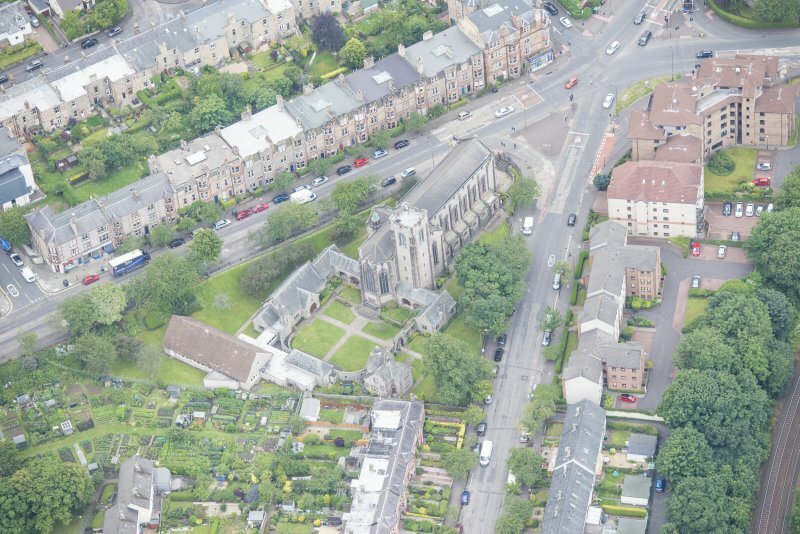 Oblique aerial view of Reid Memorial Church and Church Officer's House, looking SSE. 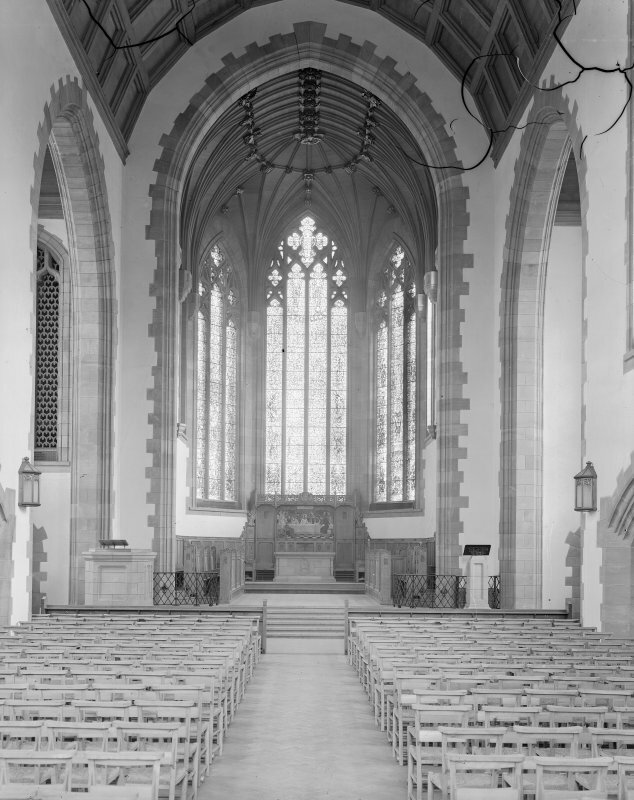 West Saville Terrace, Reid Memorial Church, interior. 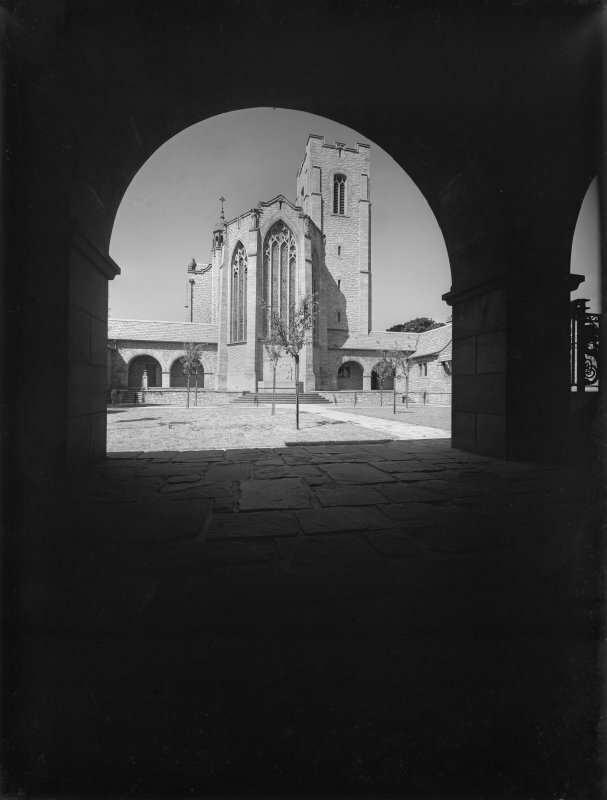 General view of Nave from West. 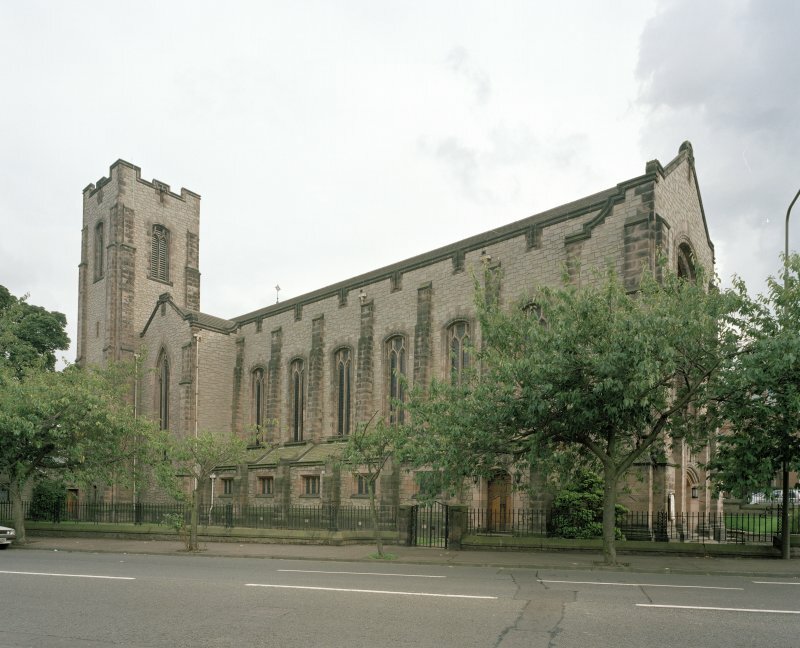 West Saville Terrace, Reid Memorial Church. 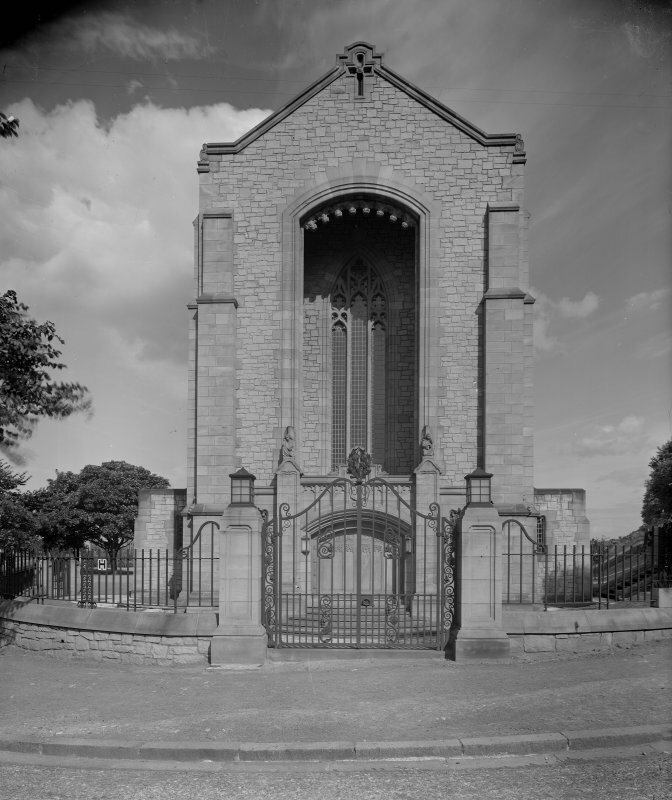 General view from North West. 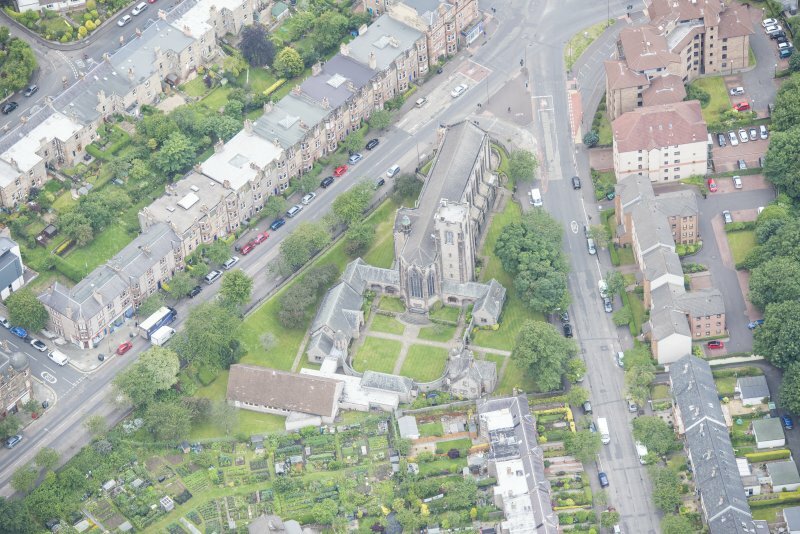 Oblique aerial view of Reid Memorial Church and Church Officer's House, looking S.
Digital copy of view of W front (gates open). 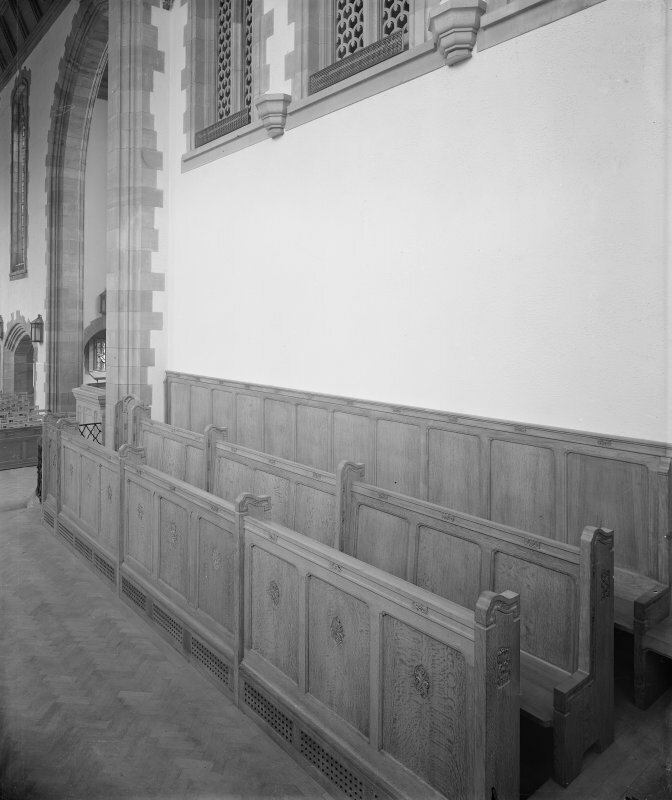 West Saville Terrace, Reid Memorial Church, interior. 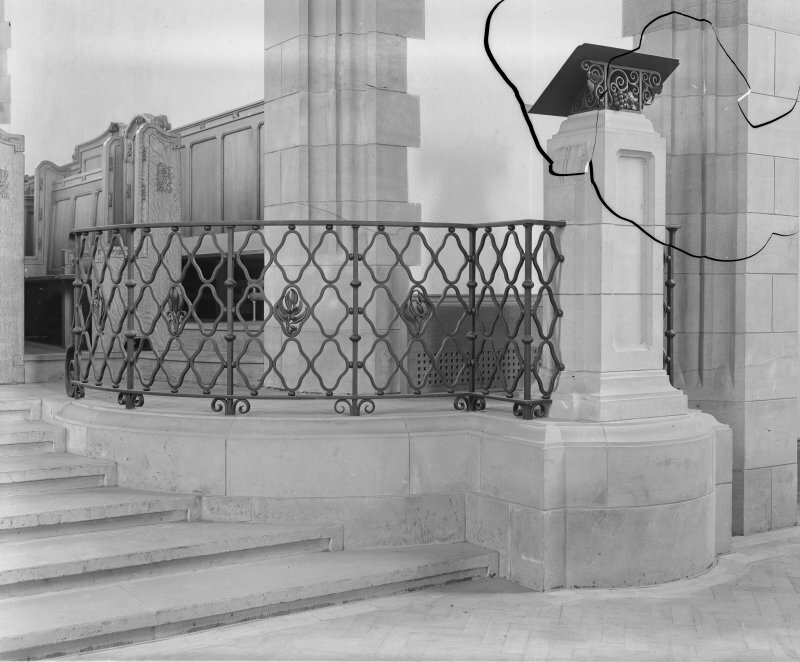 Detail of Lectern and Chancel railing. 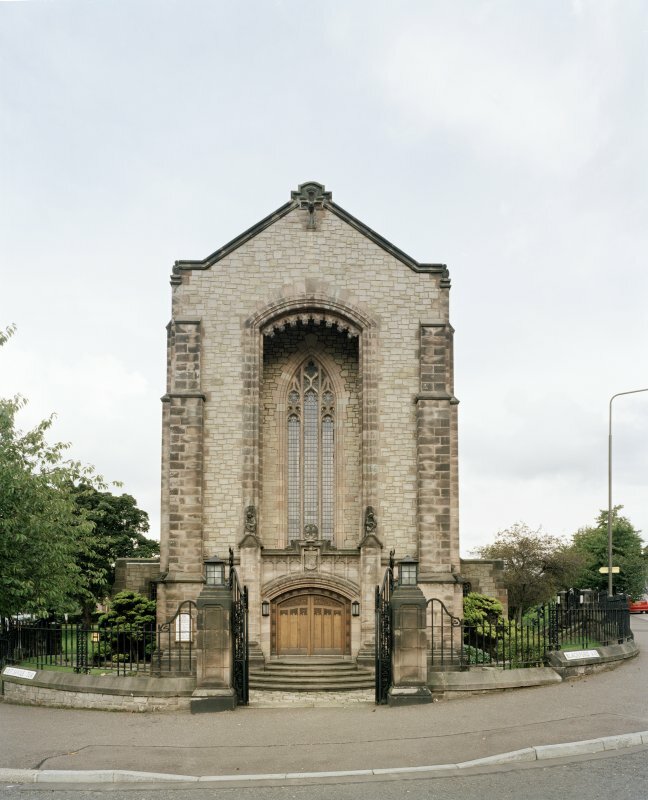 Architect:	William Reid 1929-33 - Built the church to the plans of Leslie Graham Thomson. 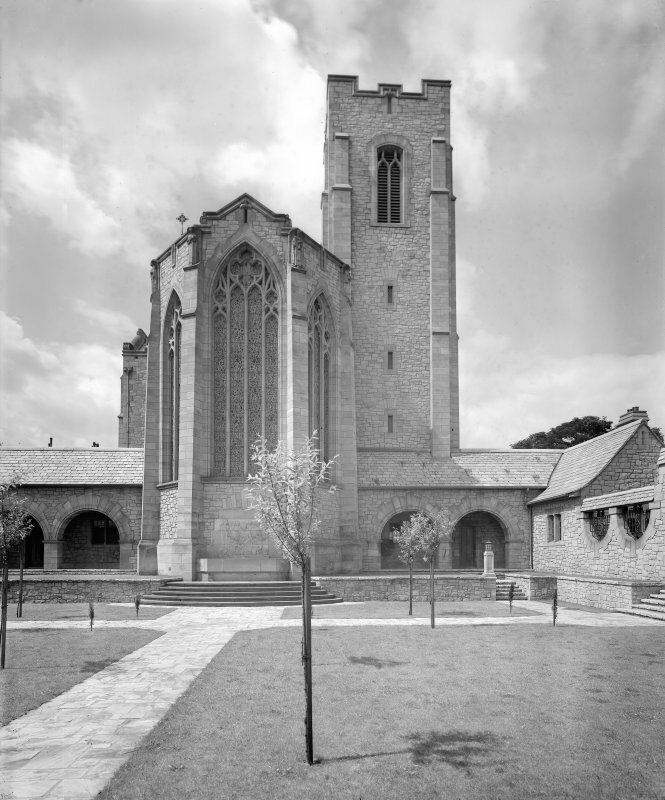 NMRS reference: Historical File: 'Reid Memorial Church'. 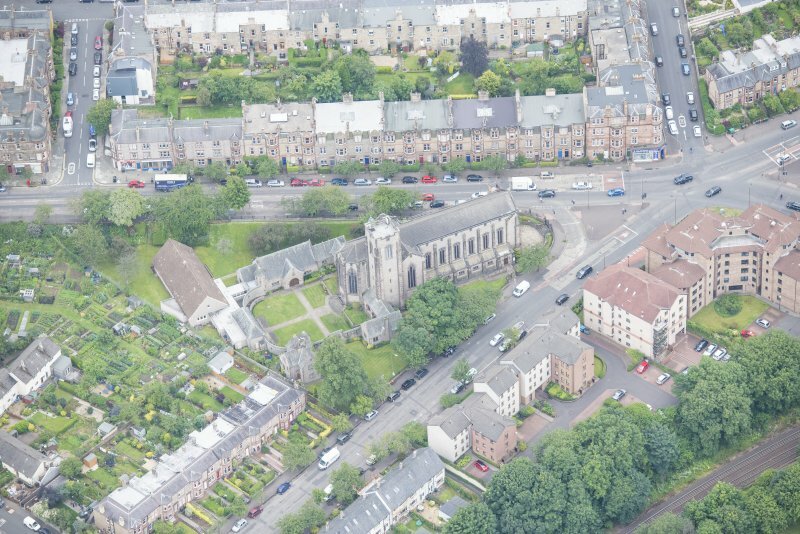 'Stands at the three-way intersection of Blackford Avenue with West Saville Terrace and Charterhall Road, and was built during the years 1929-33 by William Reid in accordance with the wishes of his son William Cramb Reid, as is recorded on the Memorial Tablet in the North Transept. 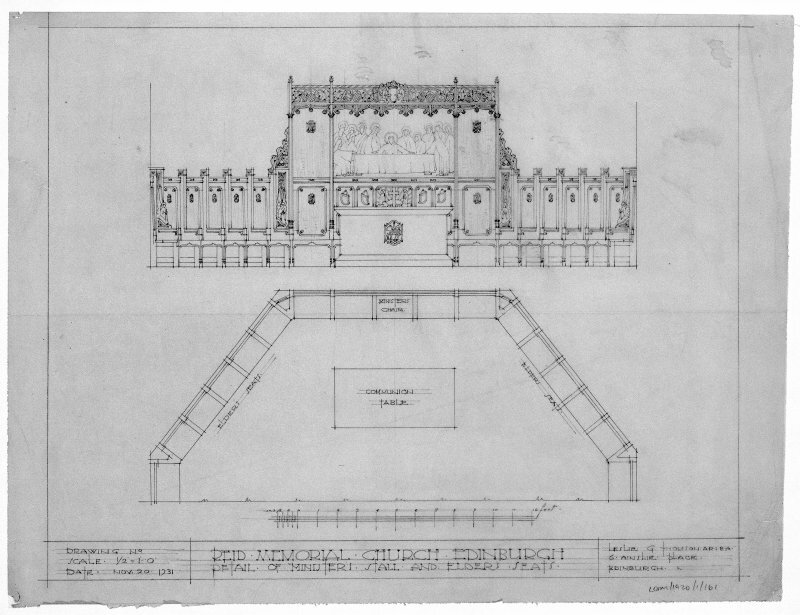 The plan of the church shows a Nave and apsidal Chancel, with short transepts. 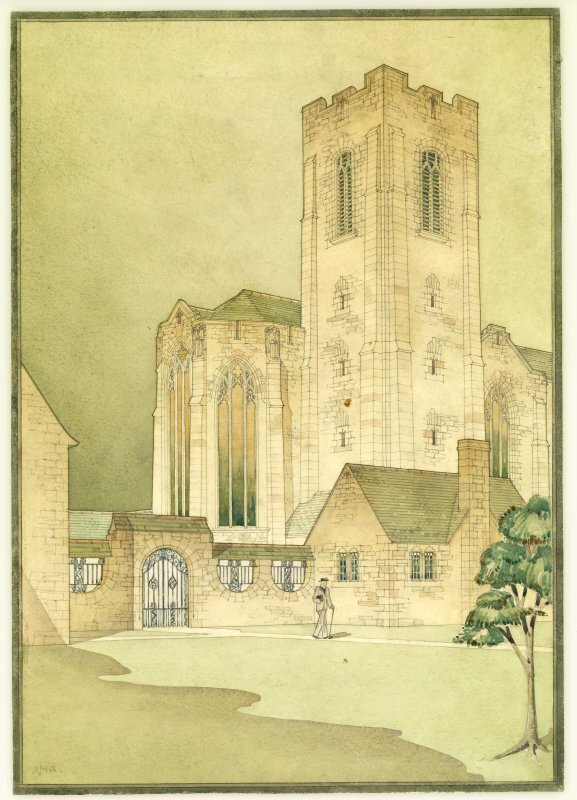 it is what has been called a free Gothic style, and, with its Hall, Church-officer's House, Vestries and other auxillary buildings laid out in the form of a Cloisteral Court, is a fine conception which seems to owe something to the influence of Robert S. Lorimer. 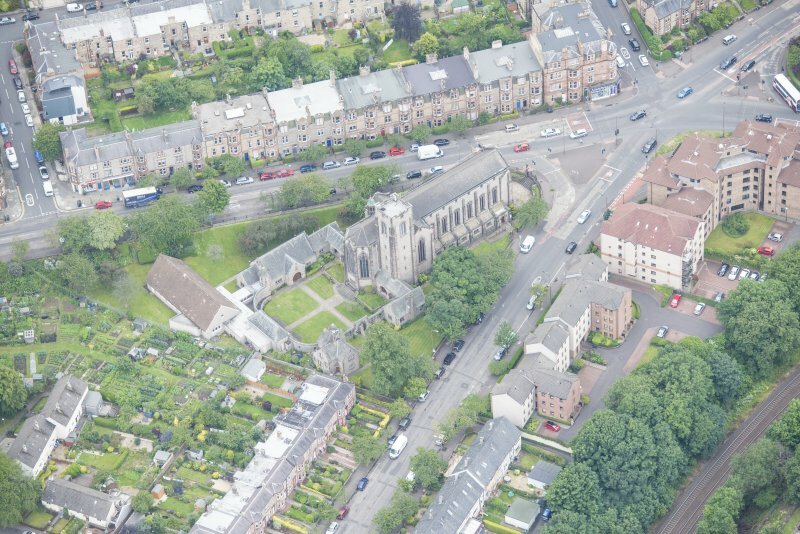 The general face work is in Craigmillar stone, the dressings and the work being in Doddington. Caithness slates have been used on the roofs. 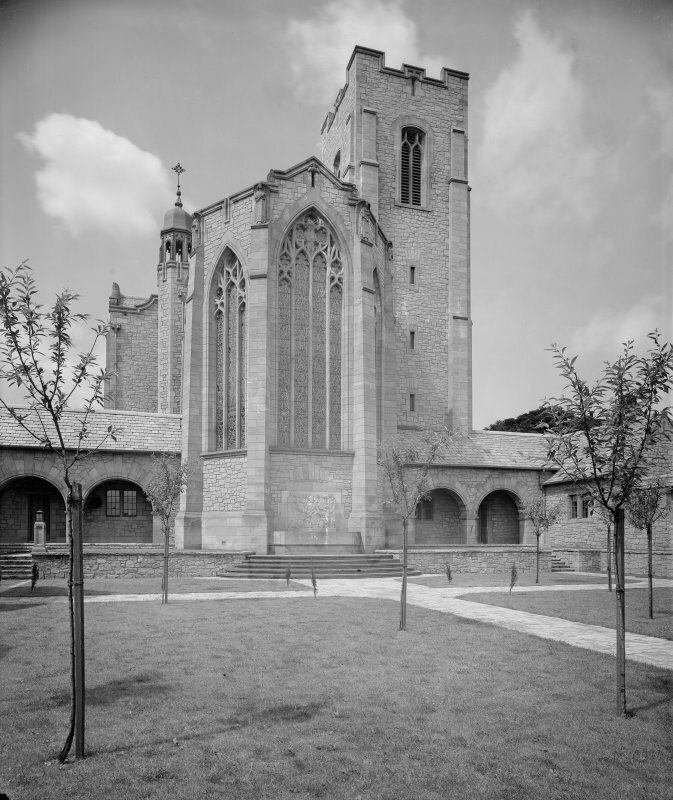 The architect was Leslie G. Thomson, A.R.I.B.A. and several noted craftsmen have assisted in the execution of the scheme. 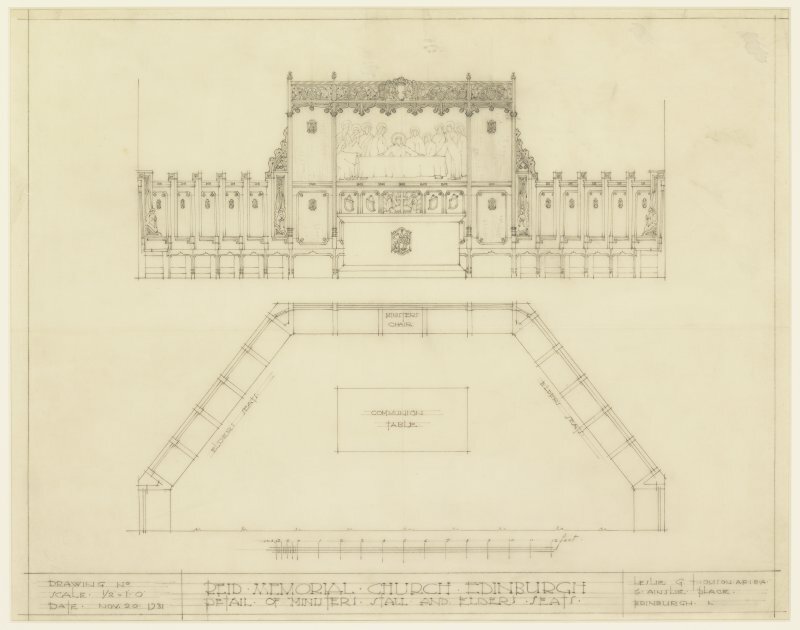 Above the Ministers and Elders stalls, framed in a carved oak canopy, is a dramatic picture by William R. Lawson, of the Last Supper, while the three great windows of the apse are filled with stained glass by James Ballentine, F.S.A.Scot. 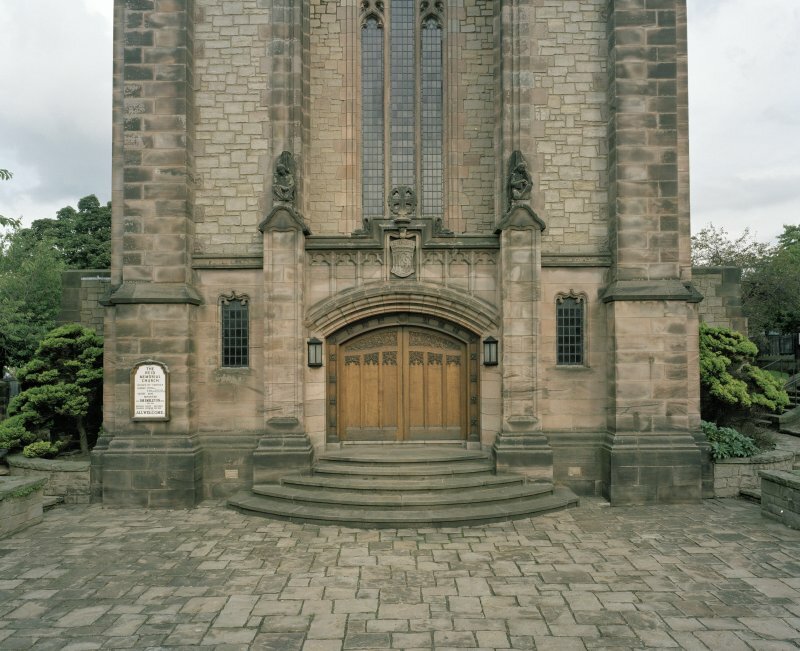 A carved figure panel in stone, in the court, above fountain basin under the central window of the apse, is by "Alexander Carrick, R.S.A., and all the wrought-iron work has been carried out by Thomas Hadden. 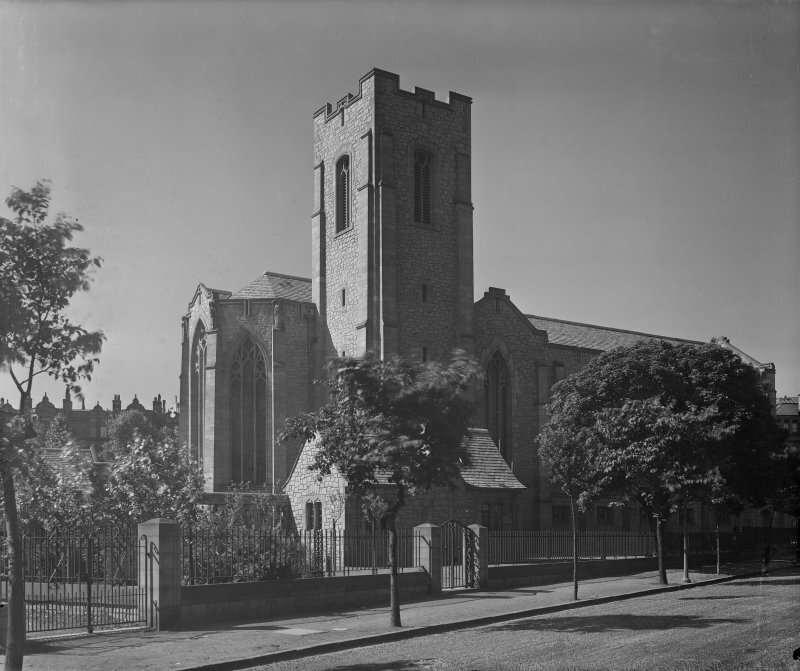 The church was dedicated on Thursday, 3rd January, 1935. 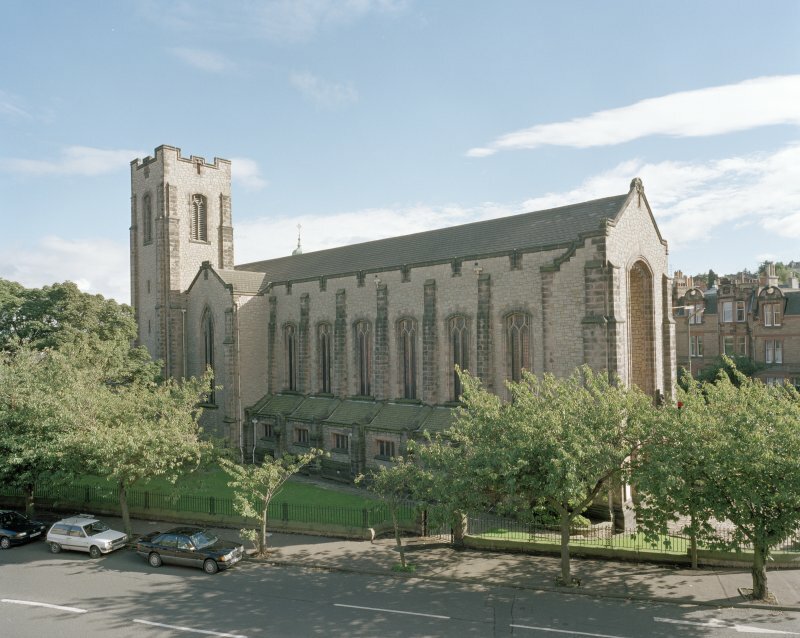 On the inbitation of the Presbytery of Edinburgh it was occupied by the congregation of what had been the Free High Church attached to the New College at the Mound, the space vacated there being utilised for the wider activities of the College. 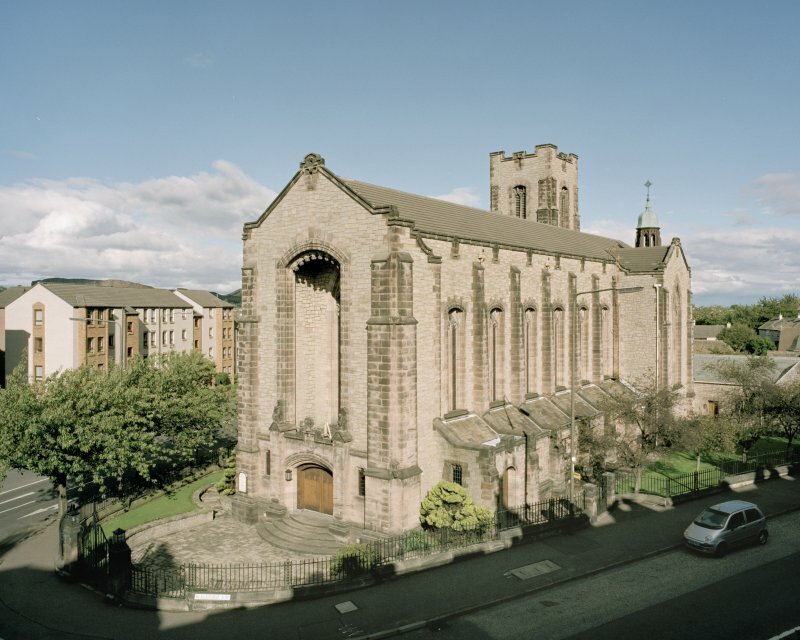 See also under the "New, or High, Church". 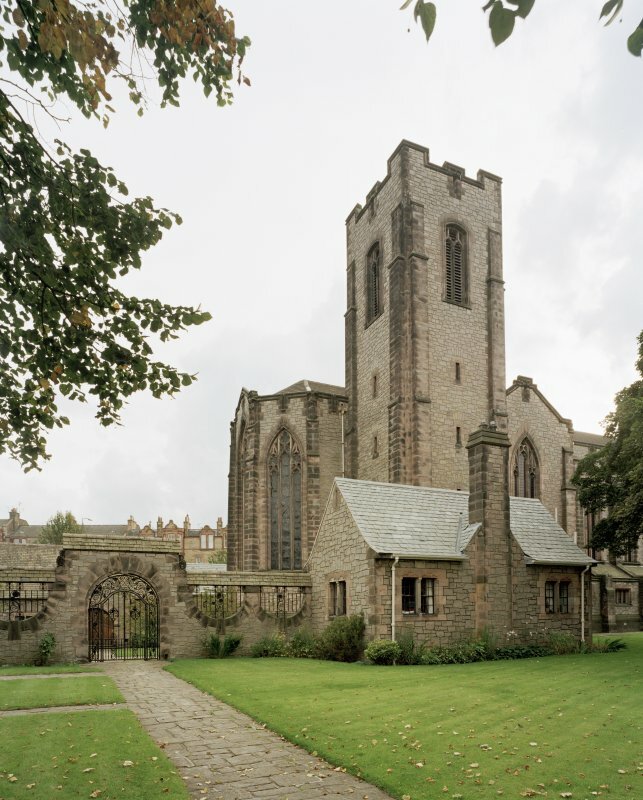 Refer to a brochure designed by Messrs Pillans & Wilson, printers, and issued by the Church Authorities before the dedication ceremony, which contains a small scale plan of the Church and subsidiary buildings, and a number of photographic reproductions of both Interior and Exterior'.